Xpress Your Essence: NaBloPoMo: Make...My Own Clothes? Today's NaBloPoMo prompt is as follows: "Have you ever attempted to make your own clothes? Tell us about the results." As I mentioned in my blog post yesterday, "I need to keep my posts very brief this week or not do them at all as something important that I need to attend to has come up recently. I did attempt, that is the operative word, to make my first piece of clothing in Grade 9 in Home Economics class. My first time sewing, you would think I would make something simple like an A-line skirt perhaps or even something simpler, but no. I made my first jumper which is a collarless and sleeveless dress worn over a blouse, shirt, or sweater. I believe it was a V-neck which entailed that I line it, not the easiest thing to do or to start out with in terms of making a garment. The fabric may have been crimplene, a form of thick polyester. It was a dark brown material. Have I sewn since? No, I guess I figured I "wasn't good enough." Since then, I think I would love to learn as I think it a useful skill to possess, if only to mend torn clothing and other items. How about you? Have you sewn any clothes or anything else for that matter? Or only to mend items? Elly,when my children were small, I used to stitch clothes for my children and also for myself.It was my hobby and I used to love sewing and knjtting. I have never sewn a dress but as a kid I would fiddle around with the sewing machine, whenever mom used to stitch something at home. 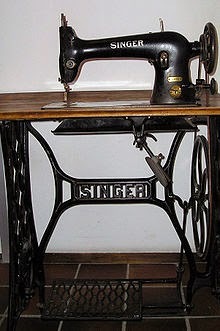 Incidentally, my mom had the same type of sewing machine! no way.. cant sew at all.. i can just fix the odd hooks and buttons.